Earlier in the month LG announced their new 18 inch flexible transparent OLED display, and now we have a couple of videos showing this new display in action. 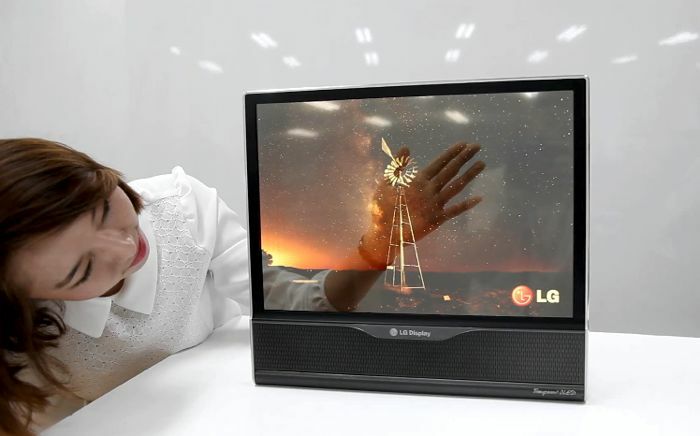 The first video shows the new LG TV using the flexible OLED display screen but what makes it even more interesting is that the viewer can view what’s behind the TV. On the other hand, the second video shows the display being bent at its maximum like the way we fold a paper It can be rolled up to a radius of 3cm while LG is working more with other sizes. We wonder, is this the future of television? LG is planning to launch a transparent and a flexible 60-inch TV by 2017 which will come with a UHD resolution. The flexible display shown off in the video has a resolution of 1200 x 810 pixels. LG further elucidated that these flexible displays could also be used in other devices such as tablets and smartphones to make an unique experience for the users. This is actually not the first flexible display that we are seeing as Samsung has already given us a glimpse of their flexible display, Youm, which would also be hitting the markets in the near future. The future seems to be all flexible. Let’s wait and watch what lies ahead!